Today is the Christmas Quiltalong Saturday for March, and our host for the day is Joanna at Needle Thread Happiness. 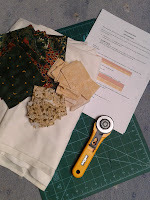 I have the second set of instructions for QuiltSue's Festive Mystery quilt, and I am all set to go! Especially as I have now dusted, vacuumed, done the washing & hung it out, put the dishwasher on, cleaned the bathroom and spent an hour or so out the front painting the railings to match the new drive gates. I've just been round the world to see what everyone is up, and now I am ready to quilt! After all that activity, I'm surprised you have the energy to do any quilting! Up & at 'em, Sue! Fuelled by red wine. NO! Fuelled by - er - get up and go, or something. Hazel! You are making me tired with this post. It is just past 11:00 am here and I haven't done anything productive...better get a move on! I'm not at my best first thing, Jeanna (lovely to see you btw), but when I get going, I get going! Oh my goodness! What a morning you're having! All I'm doing is making messes...instead of sewing in my sewing corner, I set up in the kitchen and see a sewing mess every where I look! Oh well...when blocks are done, mess will be cleaned up! Try plan A: methodically work round the area moving things each to their own place, part by part, and at the other end - voila - you have a tidy area. I would have to take a nap if I were you. What a whirl wind of activity. Happy quilting! I want your energy and enthusiasm. You fit alot into a Saturday. Thank you, Merumo! I love your Christmas project & Ms Limo is adorable! I will be back to look properly at what you have done tomorrow.